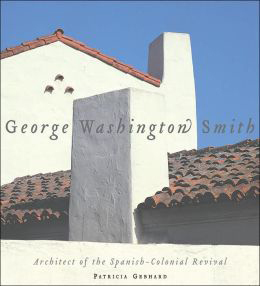 Massive white stucco walls, rolling red-tile roofs, dark wrought-iron window grilles, and lush vegetation are hallmarks of George Washington Smith’s work and have come to represent the essence of Southern California architecture. Author Patricia Gebhard accessed the notes of her late husband, architectural historian David Gebhard (author of An Architectural Guide to Los Angeles), and continued researching the archives at the Architecture and Design Collection of the Art Museum at the University of California, Santa Barbara, which houses almost all of Smith’s drawings and sketches, correspondence, and original photographs. The result is a groundbreaking volume that brings George Washington Smith and his work to a wide audience for the first time. Handsomely illustrated with color photographs and detailed drawings, the book contains a complete catalog of Smith’s work and an extensive bibliography. Patricia Gebhard grew up in Minneapolis and has lived in New York, New Mexico, and California. She obtained degrees in Art History and Library Science from Oberlin College, Mills College and the University of Minnesota. She worked in the Reference Department of the University of California Library, and has traveled extensively in Europe, the Middle East, and the Far East. She has coauthored a book on Santa Barbara County. 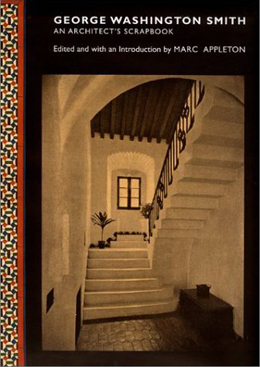 Culled from the remains of an original scrapbook comes a long overdue publication of the work of an architect who all but defined the Spanish Colonial Revival of the early twentieth century. Containing magazine articles and photographs published during Smith’s lifetime, this book is an essential addition to the library of any student, practitioner or aficionado of Southern California Architecture. It also contains a brief introduction written by Marc Appleton. 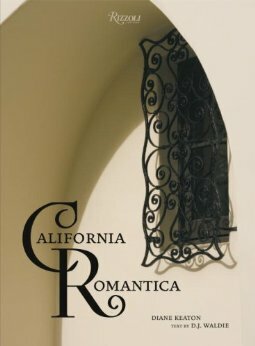 California Romantica features the most important, yet rarely seen, residential exemplars of the California Mission and Spanish Colonial styles, by such noted architects as George Washington Smith, Wallace Neff, Richard Requa, Lilian Rice, and Paul R. Williams, among others. From whitewashed stucco walls and cloistered patios to tile roofs and sumptuous gardens, each house shown is a rare masterpiece, splendidly appointed with authentic Monterey furniture, California tile, and Navajo rugs. Among the magnificent seaside estates, canyon villas, and courtyard bungalows shown is Diane Keaton’s former home in Beverly Hills, which she thoughtfully restored with noted designer Stephen Shadley, and for which she has been recognized as a committed preservationist. She brings her cinematic eye, a keen sense of natural drama, and a profound appreciation for the nuances of shadow and light to the elucidation of these buildings, through the selection of specially commissioned photography. Authoritative text by D. J. Waldie lucidly explicates the architecture and provides an intimate tour of a historic and distinctly Californian lifestyle. Santa Barbara. For centuries this temperate, inviting locale has glowed with subtle but unmistakable light– a beacon of warmth beside the profound blue of the Pacific. From the Chumash, whose predecessors can be traced to 11,000 b.c.e., to the present-day resident, vacationer, and tourist, diverse and countless peoples have been enchanted and enraptured by Santa Barbara’s spell. 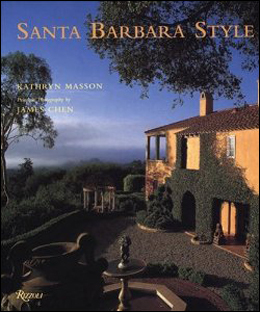 In Santa Barbara Style, author Kathryn Masson and photographer James Chen, invoke this magic and invite us to walk with them through winding and abundant gardens, onto the grounds of grand estates, and into the great houses of this region. Here we find the work of such architectural luminaries as Addison Mizner, Bertram Goodhue, and Reginald D. Johnson. We wander from the historic adobe mansion Casa de la Guerra– built in the early-nineteenth century by town patriarch Jose de la Guerra– to the spectacular, and aptly named, Villa Lucia (House of the Light)– built in 1989. We are given an intimate look at George Washington Smith’s Spanish Colonial Revival masterpiece, Casa del Herrero; and a broad view of Lotusland, the thirty-seven acre horticultural paradise. With each turn of the page, we see the beauty, grace, and style of Santa Barbara. 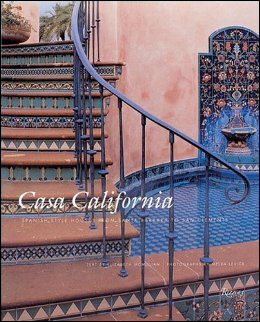 This sumptuous and comprehensive volume embraces one of the most beloved house forms, the Spanish Colonial Revival, presenting at once a lavish portrait of the style as well as the definitive statement on the subject through more than three hundred color photographs. The Spanish style in architecture encompasses facets from a vast array of traditions, many of which are in evidence in these extraordinary houses. Elements include thickset, whitewashed stucco walls, deeply recessed doors, lushly planted courtyard gardens, intricate and colorful tile work, telescoping towers inset with Juliet balconies, elaborately traced wrought-iron window grilles, and richly appointed interiors heightened by drama in light and shadow cast by moody pendant lamps and low-burning fires. The houses featured are the very best of the type, both famous and little-known, and showcase the work of architects such as George Washington Smith, Bertram Goodhue, Wallace Neff, and Paul Williams, from the early twentieth century, to the work of contemporary practitioners, including Marc Appleton, Michael Burch Architects, and others. These homes are a fantasy for living made real in the Southern California sun. Inspired by the romance of Italian villas, Spanish farmhouses, and Moorish courtyards, the Mediterranean Revival style became an archetype for sophisticated suburban homes throughout America in the early 20th century. The characteristic white stucco house, roofed with terra-cotta and ornamented with ironwork, decorative tiles, and fountains, remains the dominant style for new residences in California, the Southwest, and Florida. The Mediterranean house’s longevity is rooted in an overall simplicity and an emphasis on the outdoors. Its central courtyard, terraces, and loggias provide a fluidity between interiors and exteriors equally prized by the architects of ancient Pompeii and groundbreaking modernists. 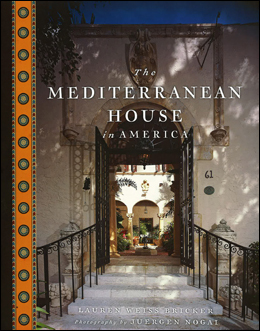 The Mediterranean House in America provides the first comprehensive survey of this popular style, beautifully illustrated in full-color photographs by Juergen Nogai, archival photos, and drawings. The Spanish-style architecture of Southern California’s seaside estates, canyon villas, and courtyard bungalows is central to its romantic image, one that has traditionally evoked a Mediterranean paradise. The details of this inexhaustively rich style– ornate wrought iron and wood balconies, colorful tiles, graceful arches, and palm-dotted gardens– reflect the region’s Spanish, Mexican, and southwestern history and culture as well as its popular outdoor lifestyle. This book showcases Southern California’s most historically significant and beautifully preserved Spanish-revival houses of this century. Twenty-one private homes built between 1922 and 1991 are featured in stunning color photography that captures exterior and interior architectural details, Spanish and Mexican antique furnishings and folk art, and lush landscaping and tiled fountains. Among these are the Adamson House in Malibu, with its extraordinary collection of custom tile from Malibu Potteries; the contemporary Greenberg House in Brentwood, by Ricardo Legorreta; The Andalusia Courtyard Apartments in Hollywood; and Casa Pacifica, the former home of Richard Nixon, overlooking the ocean in San Clemente. Brief narratives highlight the history of each building and its design influences on the Spanish-revival movement in California. Santa Barbara occupies a unique place in the development of California. Perfect weather, moneyed residents, a pool of talented architects, a long ranching tradition, and some restrictive building codes combined to make Santa Barbara a treasure-trove of interesting buildings. The major style is, of course, the Spanish or Mediterranean, and this book probably does more than any other to document this rich tradition. 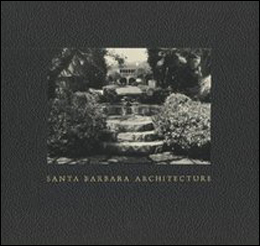 This book is useful to both architectural buffs and to anyone who wants to see and utilize the rich architectural heritage that is Santa Barbara. Montecito has always evoked considerable comment. In fact, “the mysteries of Montecito” have been the subject of many discussions and articles. Now, for the first time, a carefully researched book is available about the community and its history. Tales about the settlement have been wildly imaginative; even those carefully confirmed provide intriguing reading of this fabled suburb of Santa Barbara. Montecito was a possible candidate for a Franciscan mission back in 1784. Its hot springs—with alleged curative powers—drew health seekers, and La Parra Grande—the enormous grapevine with romantic origins—was one of Santa Barbara’s early tourist attractions. The early settlers were Indians, and ex-Presidio soldiers given small parcels of land in lieu of back pay. Next came men from the East Coast who cleared the brush and established citrus ranches. With the passage of time there were fires and floods, but still the population grew and land prices rose. The agriculture was impressive, and the crops suggested colorful gardens to winter residents from the East. By the turn of the 20th century, some large estates had been created by men of great wealth. More luxurious estates would appear in the next few decades. The climate and beauty of the area supported great hotels and resorts in both Montecito and Santa Barbara, and encouraged new residents to establish churches and country clubs. The Montecito Country Club had three locations and four clubhouses, of which one was destroyed by an unknown arsonist. 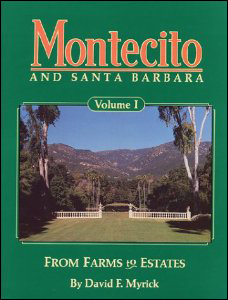 Essentially, this volume carries the story of Montecito to 1940, together with tales of some of the estates and their colorful owners. The second volume tells of more estates, schools, and the many that occurred in the next half century. The text is supplemented by photographs and maps, taking the reader back in time. 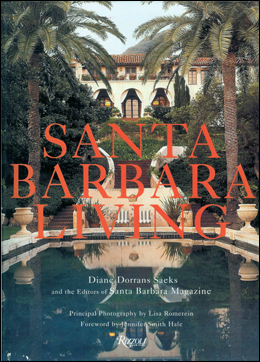 Join author David Myrick as he takes us on an historical journey through Montecito’s years of transition from a sleepy seaside town to today’s vibrant, wealthy community. 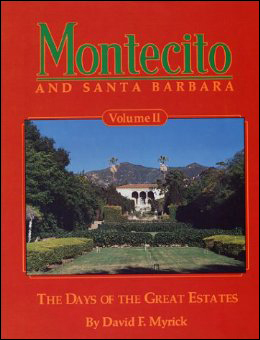 Volume II centers on the era of the Great Estates, when the influx of prosperous families changed the physical, social, and economic tableau of Montecito. This is the story of the families that came to Montecito to build great estates for their winter visits. This too is the story of the people who came only to visit and who paid for the privilege to stay at some of these palatial residences. Author Myrick takes the reader through the entire history of selected estates—from conception to destruction in some cases—and provides the family history of many of the estates’ founders as well as successive owners. The reader will sample some of the festive parties given during this era, and learn of the occasional tragedies that befell area families. The construction and development of Montecito’s great gardens also receive detailed attention. Along with the people who envisioned these beautiful gardens the reader will meet the people who built and maintained them. Many photos of these gardens are handsomely reproduced here. Beyond the history of the great estates are the supporting characters in the history of Montecito. These include the men and women who built, molded, and taught at the schools in the Montecito area. It’s also the story of how Montecito established and maintained a stable water supply; the history of the Fire Department; the construction of the area’s system of roads, telephone service, shopping centers, hotels, churches, and golf and tennis clubs. This profusely illustrated work, with over 300 photographs and illustrations, also includes the bibliography and index for both Volume I and II.